hi Dominic, Thanks for posting this. I think you are raising some really important issues about how the political intertwines with the personal. As you mentioned, it was a very difficult situation, as you were not able to engage directly with the counsellor raising the ethical issue, nor were you able to know which were his words and which were the words of the journal. You made a choice to address the wider political issues and I think that that was important, and a valid choice, even if it was an answer that upset the counsellor. I agree with you that talking about gender issues is incredibly complex and sensitive but that it is better to have the dialogue than to be fearful of saying anything. I also agree that we shouldn’t go down the road of suggesting that there has to be one correct view, or that one person’s feelings are more important than another’s. It is in the to and fro of dialogue that issues can be worked through and understandings reached and I applaud you for having the courage to engage in that dialogue. Thank you, Rosemary. I’m feeling heard and understood by you even if Thomas seemed to miss my points. It was worth a blog! For my part, I specifically asked the editor of the magazine to put me in touch with the contributor to offer support and help tailor my response but the editor refused to either delay/postpone publication or pass my details forward to help Thomas engage with me. I would also note with disappointment that ‘Thomas’ continues to remain anonymous. 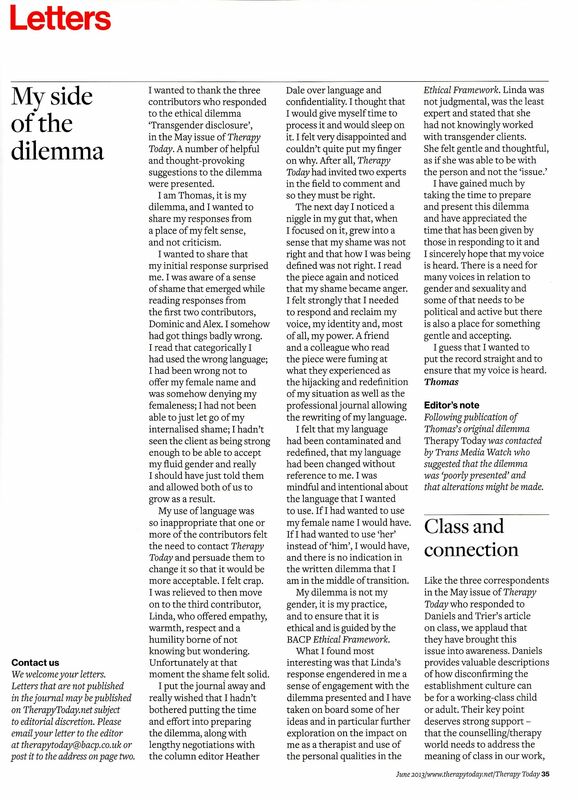 As the column (not the magazine) editor I decided to publish the dilemma because I thought the issue was an important one to raise. However it seems to me that nearly all those involved including Thomas, Alex and Dominic and myself have been bruised by the encounter. Would I publish another dilemma of such a sensitive nature? Was the pain caused to those involved worth the highlighting of the issue? I am not sure. As a PS to Alex. You will remember that I did offer pass on your details to Thomas post-publication and that offer still stands. Obviously I would not pass on his details without permission.